That’s right folks the Rams are back where it all started, Los Angeles! After a 21-year absence the franchise is moving back to LA; for now, they will be playing at the Los Angeles Memorial Coliseum but they will have a new stadium in Inglewood by 2019. 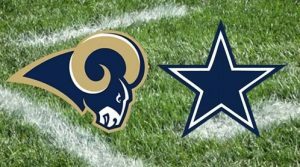 This week’s nationally televised game (will be broadcast by ESPN) is set to start at 8:00 pm ET, and will be featuring America’s team the Dallas Cowboys and the now LA Rams, both teams have a lot to prove in this preseason after a very disappointing performance last season. They are hoping they have a much better run, Tony Romo is healthy once again and for their sake I hope he stays that way. He is expected to play in this game, however, he won’t be in for long, as management wants to make sure he makes it to the regular season in one piece. Jerry Jones is holding out from bringing a veteran QB to back Romo, so battling out for the number 2 spot are Jameill Showers and rookie Dakota “Dak” Prescott from Mississippi State. Showers has a little more experience in the NFL and a very strong arm, however judging from how practices have been held Prescott seems to be favored by the coaches. So we can expect both of them to play during the pre-season as they battle it out for the No 2 spot. The Rams franchise has been down for some time, last season they had one of the worst offense in the NFL; they are hoping the move to LA will change things drastically for them. While they signed veteran QB Case Keenum for one more year they also traded a lot of assets to get the No 1 spot at the draft where they acquired Jared Goff from California. Keenum is expected to start in this first game of the pre-season and is most likely going to be the starting QB when the regular season starts, but that won’t stop Goff from trying to impress his coaches and steal the thunder from Keenum. The Rams are definitely the favorites in this game, and considering they had a relatively better season than the Cowboys it is not a surprise, I feel there are too many variables on the Dallas side and because of this I will have to take the Rams. I favor the under because of the terrible offense the Rams displayed las season and until I’m proven that they have made some serious improvements I will continue to bet the under in their games. Check out the line for this and all of the week 1 NFL pre-season games at AceSportsbook.com.